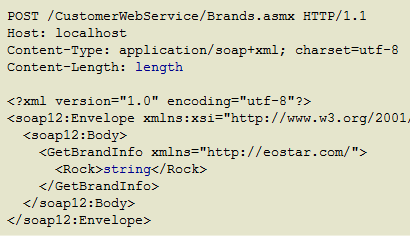 This is the API reference for Web Application developers desiring to interface with the eoStar system for the purposes of creating application for a distributor's customer to place orders, view information and provide a web-based self-service experience. Current Version: 12.3.16 Structures and programming models are subject to change. Please bookmark this page and reference from release to release to get a summary of material changes to the structures used. 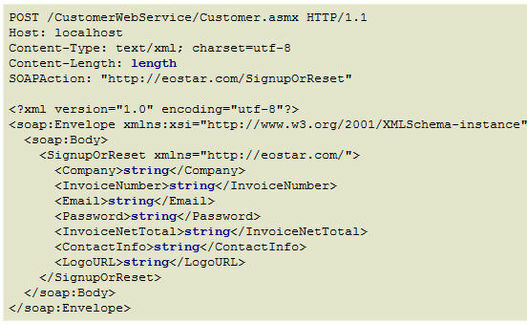 But more than just a web-based ordering mechanism, the eoStar customer web service opens up many more items that just placing orders online. The wholesale distributor's customer. That is, the retailer doing business with the distributor. 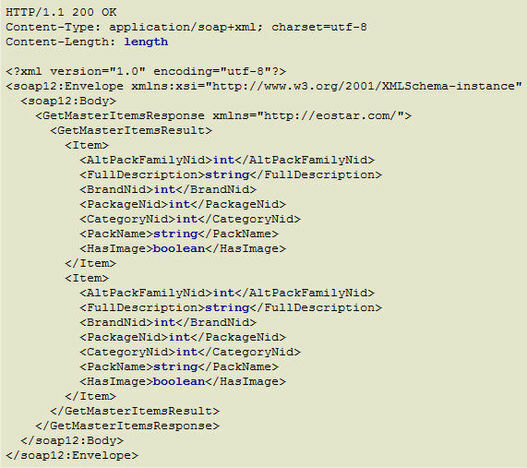 This document only covers installation of the web service component. 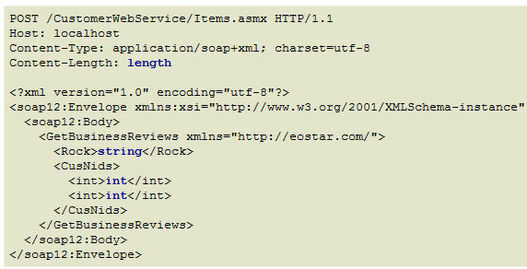 The CustomerWebPlugin is installed by the distributor and behaves like the other eoStar plugins. The web service is installed using the CustomerWebServiceSetup.msi available from the distributor, or from Rutherford once your interface account is supported. The web service operates with IIS as the hosting process. Specifically, IIS7 or better is recommended. 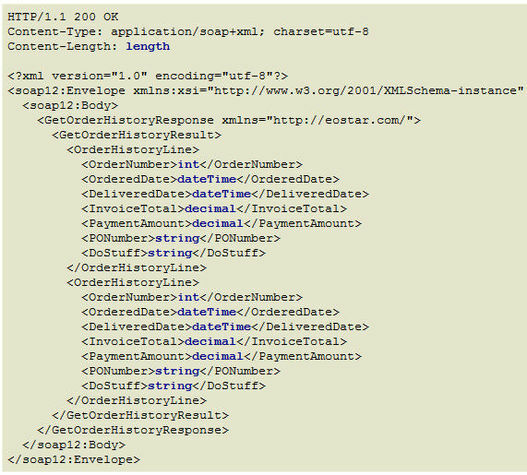 The examples and screen clips used in this document will be with IIS7 based systems. 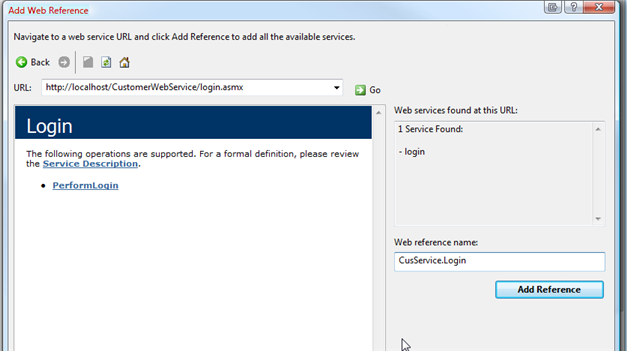 The web service itself has no configurable components, however the hosting IIS server does need to have connection information defined to connect the web service to the distributor's eoStar database. The Web.Config_and_Handheld_Connections_For_eoMobile_2009 connection configuration used by eonetservice web service is performed. It is not required that eonetservice (the mobile eostar communication mechanism) is installed on the same host as the customer web service portal. In fact, these machines may be located at a hosting provider. 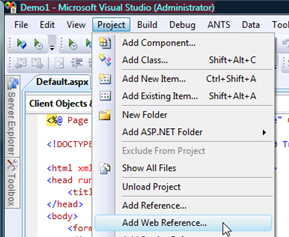 To configure a connection, you must have admin access to the IIS server. 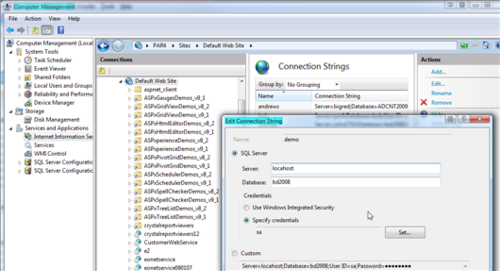 We recommend adding a connection to the connection strings of the IIS server. 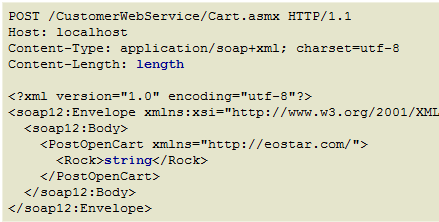 For our samples we will use the connection named "demo"
This architecture allows for a single web service to service multiple eoStar databases. Likewise, multiple web applications may use a single web service. Most customers will have a single eoStar database, but there may be eoStar deployments with multiple databases. Please consult with the distributor as to the proper connection. The Customer Web Service will be making SQL calls into the eoStar database on behalf of the web application. 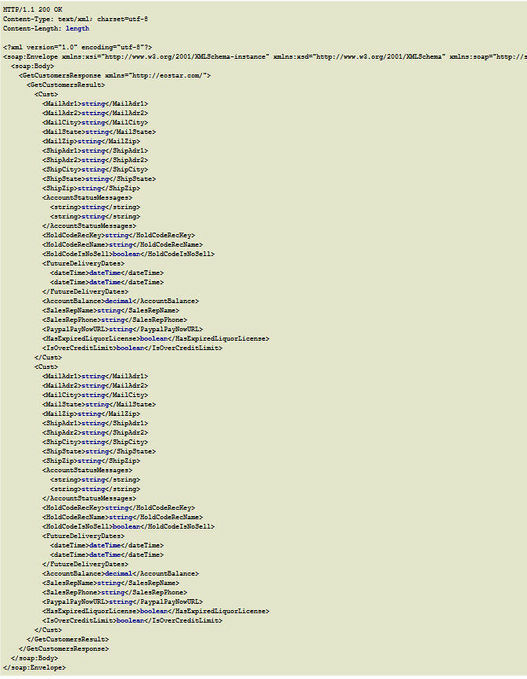 The web service manages all of the information needed for the web application. 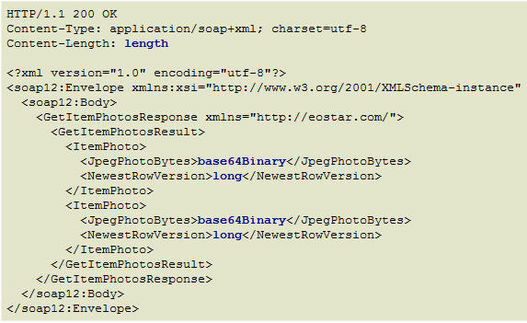 It is also web-farm enabled as session cart information is stored in the actual eostar databases enabling a secured session recovery model for web applications. 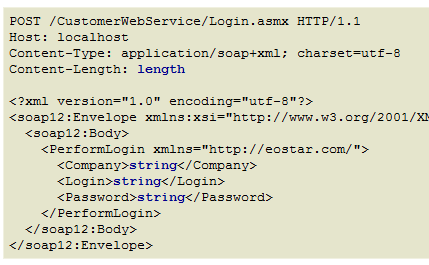 Login.asmx is the login page and used for security information between the web application and the web service - The rest of the service entry points depends on the security tokens received from this service point. Brands.asmx is the service entry point used to get information about brands. 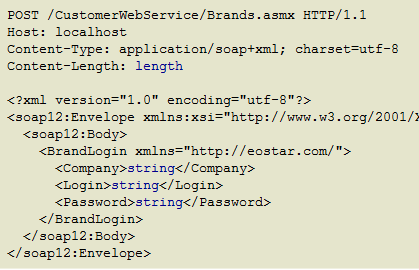 Customer.asmx is the service entry point used to retrieve customer level information for the login. It would include master information for the account(s), but also has access to historical orders delivered and basic reporting. 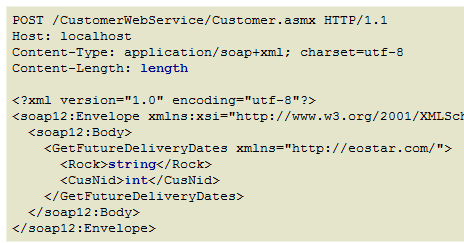 The web service returns high-level strongly typed objects as a basis of its operation. 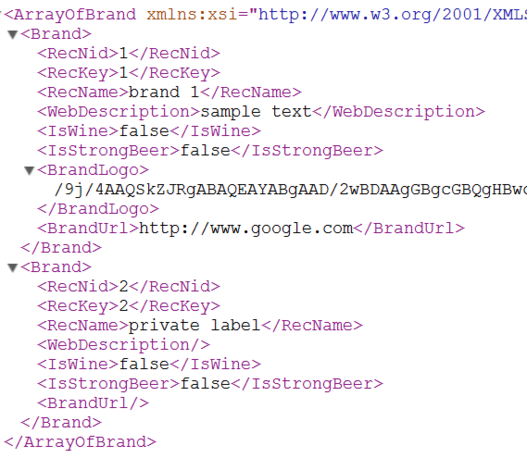 As an example, an item may be RecNid=10, RecKey="9402", RecName="Bill's Best Beer". The RecKey would correspond to how the distributor identifies the item (i.e., product number 9402). The RecName is the name of the item. The RecNid is the unique identifier for that exact product in the distributor's database. No two records of the same type ever have the same RecNid. True of this outlet's permits or licenses have expired. 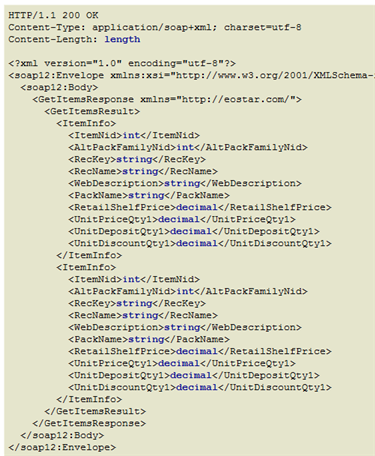 This is a result class when attempting to add item(s) to a web shopping cart. 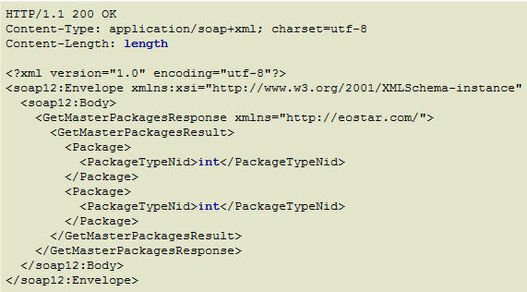 There are many checks in eostar when adding an item to a web shopping cart. For example, the item may not be allowed to be sold to a particular customer. If this is filled out (non-blank), then there was a problem adding this item to the web shopping cart. This is the text reason why. 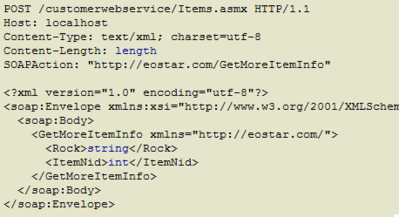 this is the newest version identifier in eostar. The URL corresponding to the brand information. 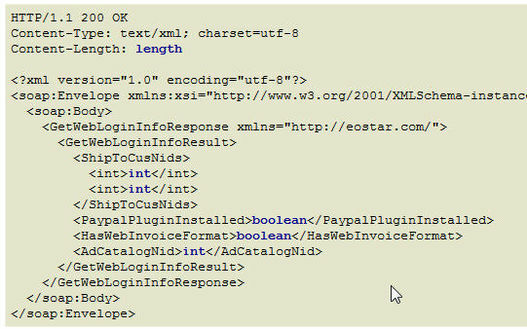 This is an array of RecNid which point to #Cust records that this web login is can take orders for. A single web login may take orders for 1 or more customer ship-to outlets. 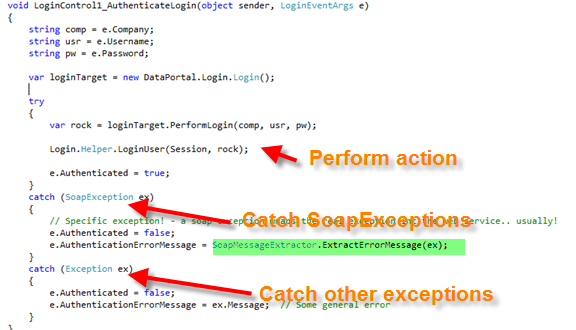 This will create (in an ASP.NET application) a service proxy to the customer web service login service entry point. 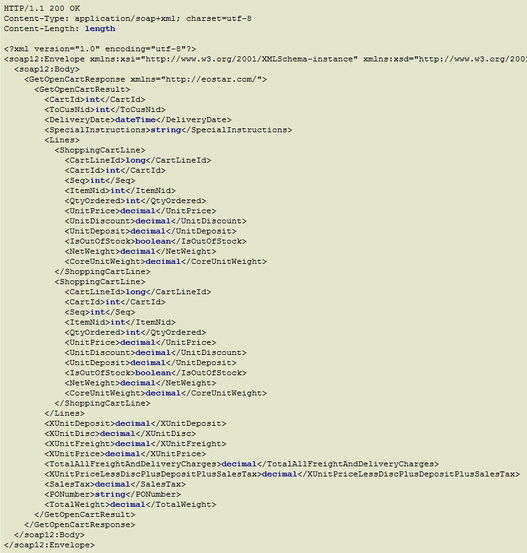 You would similarly do so for the other service entry points in for the web service. 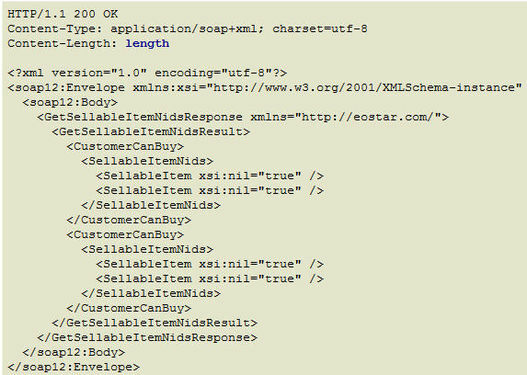 SOAP protocol rules stipulate that all web service exceptions must be wrapped in a SOAP envelope. 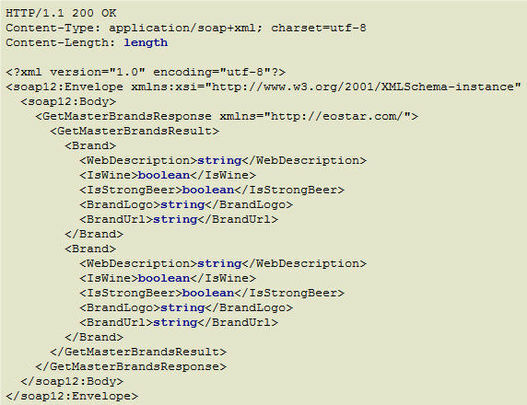 This will require a slight amount of work for the web application developer to determine the proper error, the developer will need to unwrap the exception a little bit. 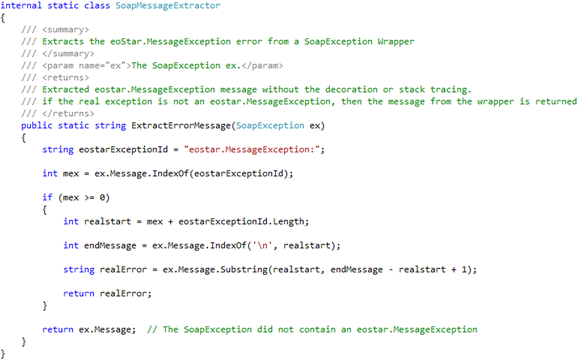 You may use this C# code in your web application. 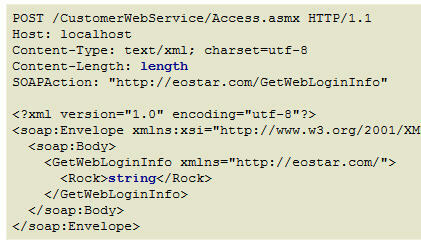 If an eostar.MessageException is discovered, then it is a fault generated by the web service. Other exception types may not always be related to the web service (connectivity failures, for instance). Also, many service entries provide a "RefreshData" method. 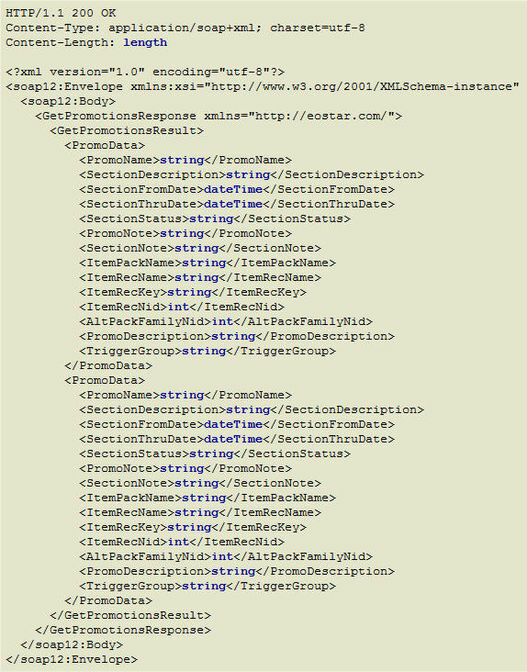 You may call this at your convenience, however other service calls should automatically refresh the data store the web service uses, and thus not strictly needed. The is the call needed to establish a session, and verify credentials. The successful response is a security token used for all of the rest of the service points. Login: The customer web login. This is assigned by the distributor. 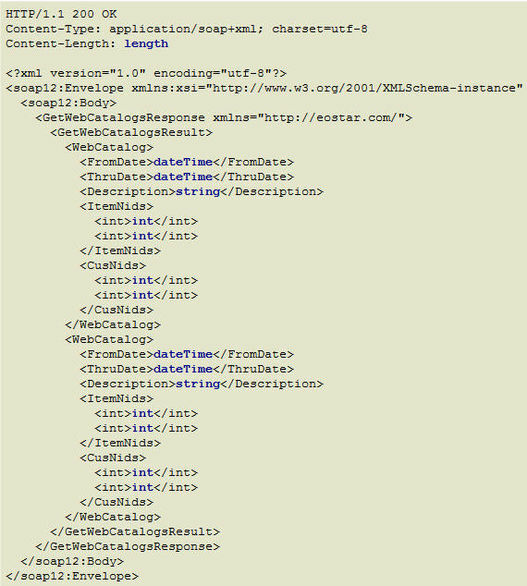 The return values are an array of DateTime objects which correspond to valid delivery dates as determined by the distributor for the specific customer account. Each customer may have different sets of delivery dates due to scheduling and licensing issues. For example, a distributor handling both alcoholic products and non-alcoholic products may have different delivery fulfilment dates depending on the driver, which must be licensed to carry alcoholic products. This method returns a PDF of a given invoice. Note the response is a byte stream, not a url. This emails the web login password to the main contact for the account. This is the mechanism in which a customer can self-signup for a web account with the distributor. If successful, then the email and password specified here can immediately be used to place orders with the distributor. It is ALSO used to change a web login password. The distributor may have this function disabled as it is controlled by the distributor. In that case, the distributor's personnel are the only ones that can create a web account. It is very convenient for the customer account to self-signup. 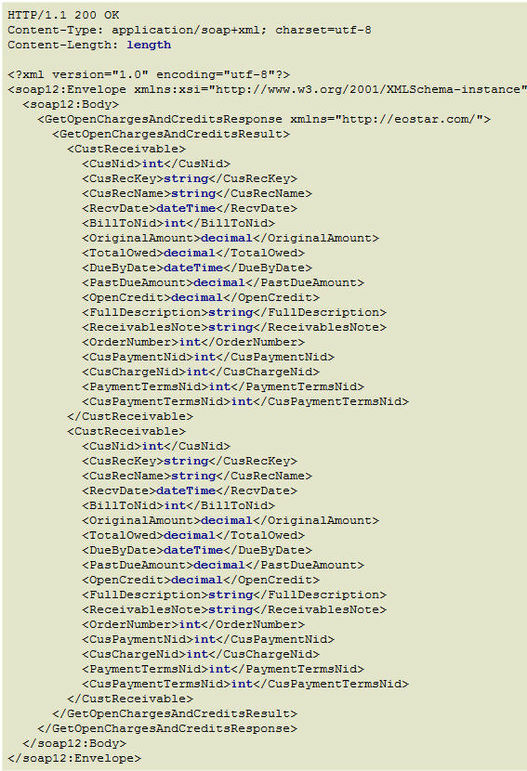 The input parameters found here are used to verify the customer's identity. 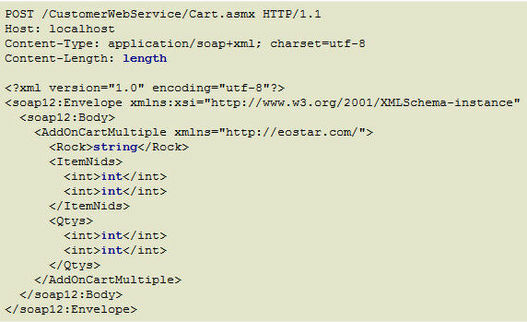 The only cart the web application developer is able to manipulate is the Open cart. There is for any single login, only ONE open cart at any time. When a cart is submitted or posted, then it becomes a closed cart. 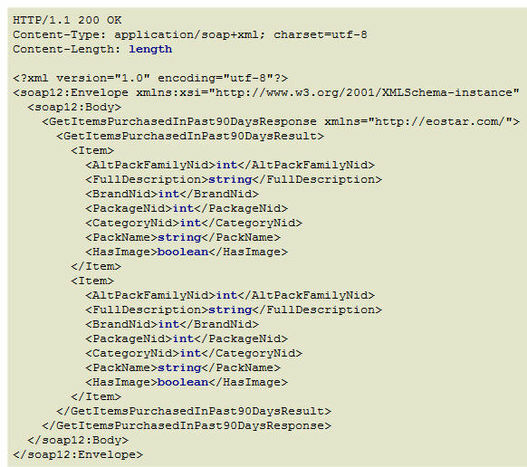 That cart can no longer be manipulated or accessed from the web application. A closed cart has been submitted, but has not yet been processed by the distributor. A finalized cart is one in which the distributor has accepted into their system and is scheduled to be processed with all of the other orders for the day. The response is a blank string if everything is okay. If there is any message, then the items could not be added to the cart. The response is a blank string if everything is okay. "There are no items in your shopping cart"
"The requested delivery date for your current shopping cart is in the past. Please review your cart and adjust the delivery date"
"There are nnnn items in your shopping cart. The total is $$$$"
Get open cart returns the one open cart for the particular login. It may be completely empty (meaning, no open cart) For details on the cart lines, see the web cart section above. This method always returns a non-negative number. 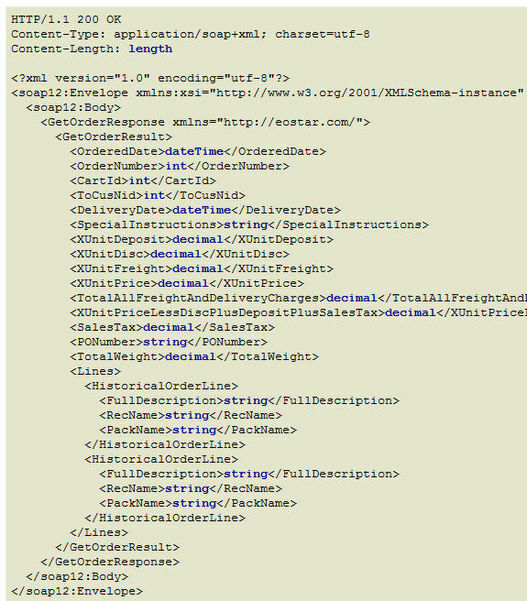 The response is a boolean indicating if the open cart was able to be submitted sucessfully. Unsuccessful posting WILL generate an exception. 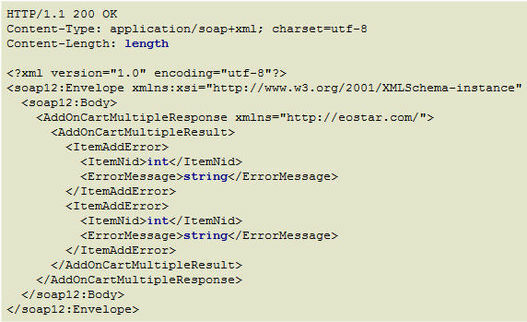 That is, the programmer will never see a "false" response from this method EXCEPT when trying to post an open cart with no items in it. 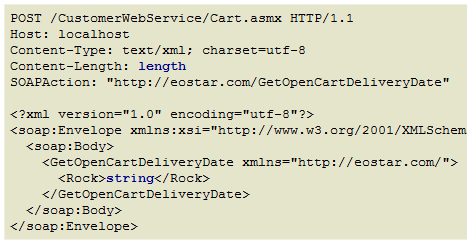 Once an open cart is posted, the web application is free to create a new cart. A new cart is created when a product is added. The response includes all of the brands set up for the given brand login. The brand logo is included as a base64 encoded string which contains a JPG image. This page was last modified on 19 March 2012, at 15:48.